Earlier Elgin movements are identified by model and class as well as grade.In each watch size, there are several model numbers. The model numbers refer to the basic design, such as the type of plates, open-face or hunter case movement, etc. Model numbers are unrelated across watch sizes (two watches of different sizes that are both model 8 have no connection to each other). The same model numbers are also re-used across movement grades and classes. Elgin stopped publishing information on models and classes in 1915, using movement grade afterward as the primary means of categorizing their products. The measurements in the following table are commonly referred to pocketwatch movement sizes from large to small. These are the sizes made by Elgin in its earlier decades. 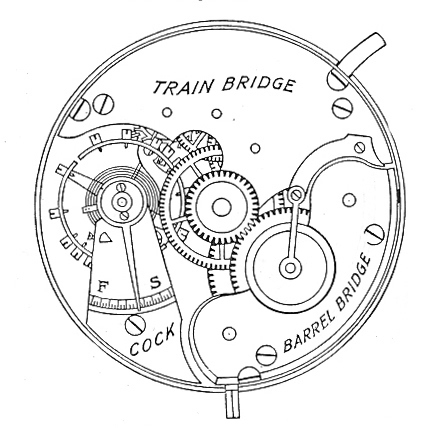 The size of the movement is measured as the narrowest distance across the dial plate. On round pocketwatches, this is just the distance across the lower plate, right through the center. Measuring the dial itself will come pretty close on most watches, but that distance will often be a bit less. Importantly, this measurement is the dial side of the movement, not the size of the watch case. There's more about watch sizes here.